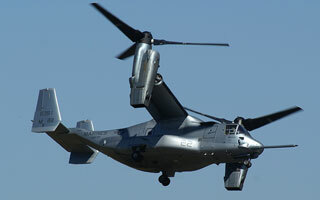 Ramon van Opdorp reports on the 2006 edition of the Royal International Air Tattoo (RIAT) which took place at RAF Fairford on July 15-16, 2006. This years Royal International Air Tattoo was held at 15 & 16 July, with on both days absolutely great weather with temperatures over 30 degrees Celsius. This time I flew with a KLM Fokker 50 straight to the airshow, which is in my opinion the best way to visit this large-scale show. Just hop on the aircraft, and arrived on the airshow, walk out the aircraft, go pass the security and you are on the show ground. Without the travelling by bus for 12 hours, or stuck in all the traffic jams around the show. Main themes of this years RIAT where the “Rapid Global Effect” and the “Army Aviation”, with for both days a large number of invited aircrafts. This time the RIAT had a very impressive list of visitors invited, which included a USMC MV-22 Osprey both on static and flying, a Russian Mig-29OVT with one of the best displays I have ever seen, a C-130B Hercules from Pakistan, one Slovenian PC-9, a Mi-17 Hip & flying Mil Mi-24V Hind-D from the Czech AF. The brand-new F/A-18F Super Hornet, piloted by Boeing chief test pilot Ricardo Traven, and a display of both the RAF and Spanish AF Euro fighter/Typhoon. And last but definitely not least, the last public show and appearance of the always-beautiful PR9 Canberra. Display teams where present with the Patrouille de Suisse, which made a very special fly-past in combination with another Swiss product, the Pilatus PC-9. The always present and stunning RAF Red Arrows, which performed a fly-past on Sunday with the retiring VC-10, from No 101 Squadron based at RAF Brize Norton. And the Patrulla Aguilla of the Spanish AF, which where celebrating their 20th anniversary. Also present every year, and participants that will never get you bored, where the massive B-52 BUFF. 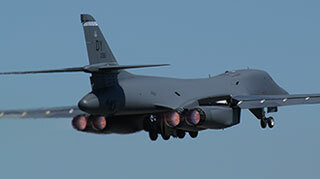 And the B-1B lancer with the best and most impressive take-offs there are. When this beast turns on the engines at full throttle and ignites the afterburners, it will blast you out of your shoes. Several high and low speed fly-pasts where made, and the B-1B is special in this case due the fact it can move it’s wings to the back for high speeds, and move them in normal, forward condition for low speeds. Already earlier stated, was the best display I have ever seen by the Russian Aircraft Corporation duo, Pavel Vlasov and Mikhail Belyaev on the MiG-29OVT also known as the MiG-35. This is an evolution from the well-known MiG-29, and was painted in the well-known Russian display team colours, of the Russian “Swifts”. This aircraft has a special engine outlet system, which can steer the “Dovetails” and deflect with this the propulsion blast. A absolute impressive and mind blowing display was flown, which included high and low speed fly-by’s, barrel rolls, steep and high pitch dives. And the most impressive move with the “Cobra”, where the aircraft is coming to a vertical stop in the air for a few seconds. Overall a very complete and impressive display of this rare aircraft, and well deserved winner of the RIAT “King Hussein Memorial Sword”. The static show at Fairford is known to be not one of the best for photographers. But with some special lenses and a lot of searching for the right positions, you could make some very nice photographs from a Turkish F-4E Phantom II, two A-7 Corsair IIs from Greece, the Pakistan Air Force C-130B Hercules. This aircraft is unique as it's the last of the "civilian" versions of the Hercules serving with the 6sqn of the Pakistan Air Force. Also present was a EH-101 SAR helicopter from the Danish AF, flown from the Westland plant at Yeovilten, and a Boeing 707 from the Royal Austrailian Air Force. Overall again a great job from the RIAT organisation, by gathering so many nice and special participants on one place. The Royal International Air Tattoo 2006 is the biggest "airshow" of the year and this year under blue skies for much of the event. Every year again the struggle, to get special and never seen participants to this airshow, but till know it looks like they have done it again. Therefore count me present for the 2007 edition of the Royal International Air Tattoo.